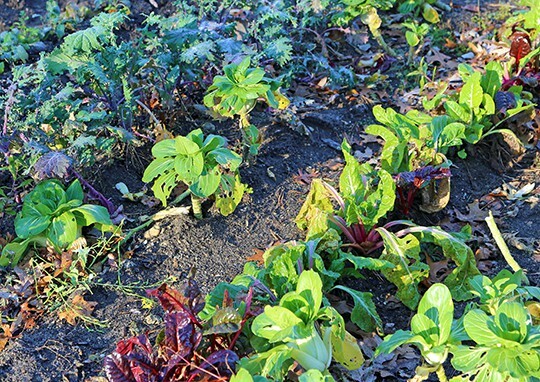 Dec 13, 2012 | my gardens, Reasons To Grow Your Own Vegetables, What's for dinner? Only one quarter of the veggie garden still contains plants, and these grow thinner as we harvest. Still, to be eating from the garden on the thirteenth of December is a real blessing and we don’t take it lightly. 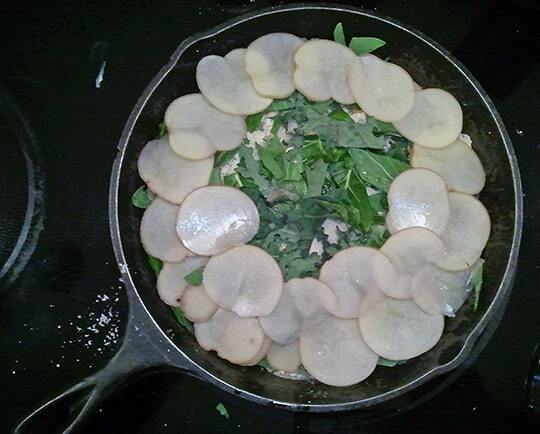 Some of tonight’s dinner came from the garden (chard, kale and pak choi), some from the root cellar (potatoes), and some from the freezer (tomatoes)….mushroom cutlets from store-bought ingredients. Tonight’s dinner is another example of the way that a garden can focus our attention and gratitude in a way that varies from the usual day-to-day experience. If I was making the identical dinner from supermarket produce I wouldn’t have the same level of appreciation (not to mention the same amount of taste) that I do having grown many of these ingredients. The garden feeds us twice: once with the food we eat and again in perspective and thankfulness. Only the most cold-hardy veggies remain. We've had several nights when the temperatures have gone down to 28 degrees. When it's this cold the plants don't regrow once we harvest the greens, although I have another batch under row-cover that I'm saving for the future. 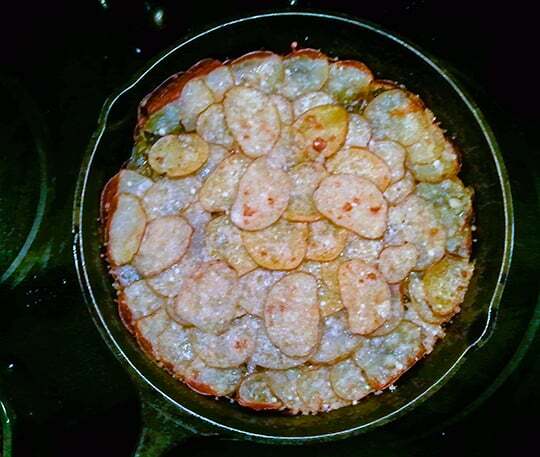 Tonight's dinner is a variation on a recipe I've posted here before: thin sliced potatoes layered in a cast iron pan. 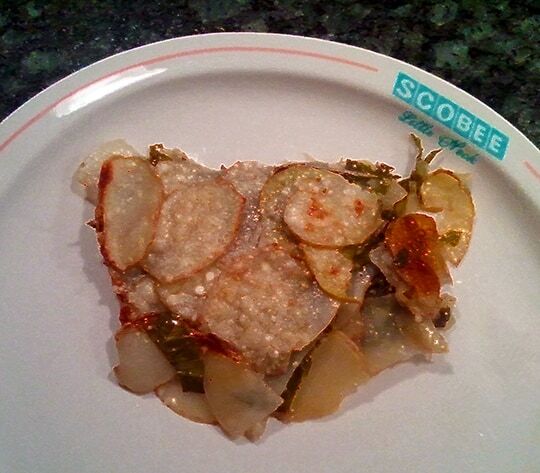 As a garden cook you work with what you have, so this evening I sliced the greens and placed them in between the layers of potatoes, sprinkling in some Parmesan cheese and a few bits of butter. Add salt and pepper if you wish. Heat the pan on top of the stove for about ten minutes and then put it in the oven, covered with a lid that presses down on the potatoes. Bake at 350 for about thirty-five to forty minutes. Take off the lid and turn on the broiler for about 5 to ten minutes to brown the top. Sprinkle with more cheese in the last three minutes. I also used some Pensky's Smoked Paprika in this dish. You could add more cheese if you wanted this to be a main dish.